If you read TTI’s recent article comparing point-to-point cabling and structured cabling, you already know that we’re singing the praises of structured cabling. After all, it’s cost-effective and easy to repair, and it offers impressive flexibility and an outstanding lifespan. However, before you schedule your installation session, you should gain a full understanding of the system your company is receiving. We’ve created a short comprehensive guide for business owners about structured cabling’s complex infrastructure. A frequent question we get asked by businesses is “How does structured cabling look?” The easiest way to answer this question is to contrast these structured systems with older, point-to-point cabling. Instead of having a spiderweb of jumper fiber cables running everywhere, which is the characteristic look of a point-to-point system, structured cabling’s appearance is much more streamlined. After all, as a system, structured cabling promotes superior organization within its infrastructure. Let us explain: Centralized around the Main Distribution Area (MDA), a structured cabling system contains a collection of patch panels and trunks that build a cohesive structure, where hardware ports are easily connected to patch panels, which are in turn joined to additional patch panels. Basically, instead of requiring a mess of cables, structured cabling allows servers and storage units to connect to a single communication center. 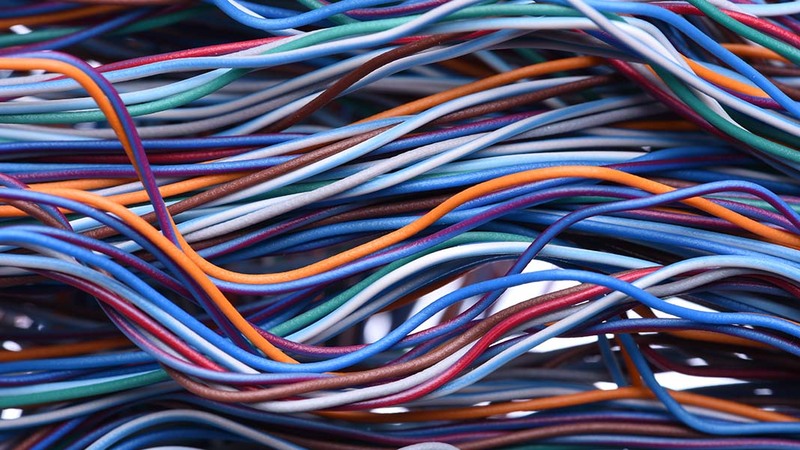 As a rule of thumb, forgo the headache of multiple wiring infrastructures — like point-to-point cabling — at all costs! Any business can benefit from structured cabling. Whether you’re a small company that’s seeking to expand or a medium-sized office with stable needs that requires reliable data transmission, this modern infrastructure provides fast, efficient service. Supporting lightning-speed bandwidth, a structured cable system gives unparalleled reliability because it’s scalable, flexible, and highly receptive to industry changes. With this form of data cabling, you’ve banished the risk that your system will become outdated. Furthermore, if there’s ever an issue with your structured system, your IT providers can quickly troubleshoot to find the problem’s source. With a point-to-point system, it can take ages to wade through all the crisscrossed cables. This wasted time can cause your IT bills to skyrocket, while your company’s productivity levels dwindle. So are you feeling ready to fast-track your company’s data? It’s time to contact Houston’s TTI. Our technicians are experts at installing structured cabling systems, which continue to grow and evolve alongside your thriving company. Request a free quote online, or call 713-791-1884 to reach our knowledgeable staff on our 24/7 hotline.